Add all the ingredients to your food processor and blend for 1 minute until mixture is dough-like and sticks together. Sprinkle left-over coconut onto a flat plate. 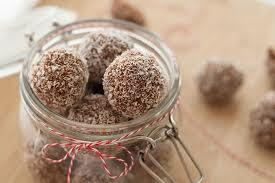 Take a dessertspoon-sized portions of the mixture, roll into a ball and then roll in the coconut. Put truffles into a container and leave in fridge. Truffles will last in the fridge for about a week and they do freeze also.